Nina and Scott on the 2019 Honeymoon Israel trip. jHUB also provides new ways for interfaith couples and families to comfortably explore, discover, and personalize the meaning of Jewish culture and values in the modern world. As newlyweds, Scott became even more curious about Judaism as the two cultures began to mesh. Through a suggestion from Rabbi Lader, Nina and Scott then looked for more ways to meet others in the community through jHUB. 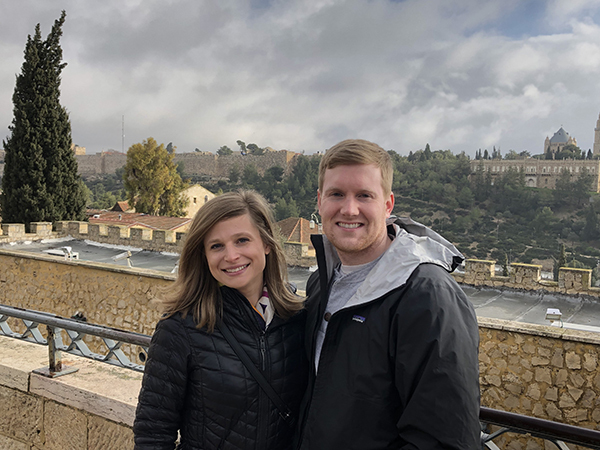 Nina and Scott recently had an opportunity to visit Israel as a couple for the first time through Honeymoon Israel, which provides trips to Israel for couples with at least one Jewish partner. jHUB is Cleveland's local partner with Honeymoon Israel. For more information on jHUB, please contact Rabbi Melinda Mersack at mmersack@jecc.org or 216-377-6007.